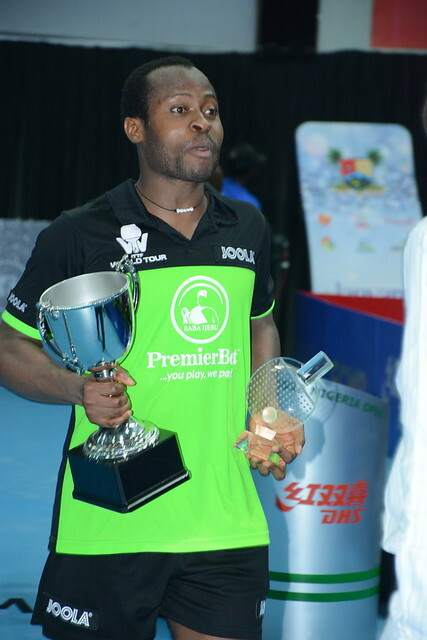 All Chinese Women’s Singles semi-finals, Guo Yan and Sun Chen emerged the successful players on the morning of Sunday 12th August at the 2018 ITTF Challenge Seamaster Nigeria Open in Lagos. Guo Yan beat Wei Wensheng (11-4, 11-9, 14-12, 11-4), before Sun Chen accounted for Fan Siqi, the no.12 seed, recovering from a three games to nil deficit to secure victory (8-11, 9-11, 3-11, 11-8, 11-3, 11-8, 11-6). Success in four straight games for Guo Yan, it was an engagement in which Wei Wensheng missed her chances. Guo Yan made the better start, she won the first six points of the opening game before Wei Wensheng found her feet. The second and third games were very different. Wei Wensheng reduced the number of errors; in the second game she led 9-7 but then lost the next four points. Similarly, in the third game she established an early lead only for the deficit to be reduced to one point at 9-8; Wei Wensheng called “Time Out”. Initially the break worked, she went ahead 10-8, Guo Yan responded to capture the next two points, before at her second attempt, securing the game. It was the crucial stage of the contest, Guo Yan now confident, she totally dominated the fourth, a place in the final was booked. Fast counter attacking rallies were the feature of the contest, it was the same in the immediately ensuing encounter between Fan Siqi and Sun Chen; the only difference being that Sun Chen is a pen-hold grip player using short pimpled rubber on the forehand, as opposed to her colleagues who adopt the shake-hands grip with the smooth reversed rubber on each side of the racket. Consistent, Fan Siqi won the first two games were close, at the crucial stages innovative services reaping dividends. Increasingly confident she established a 4-1 lead in the third game; Sun Chen called “Time Out” but there was no stopping Fan Siqi, a three games to nil lead was established. Both players prepared to step around the backhand to execute their favoured forehands, Sun Chen playing more positively captured the next three games; a deciding seventh game beckoned. Now the momentum had completely changed; Sun Chen won the first six points of the seventh game. She never looked back, at 10-6 she held four match points, she needed just one.